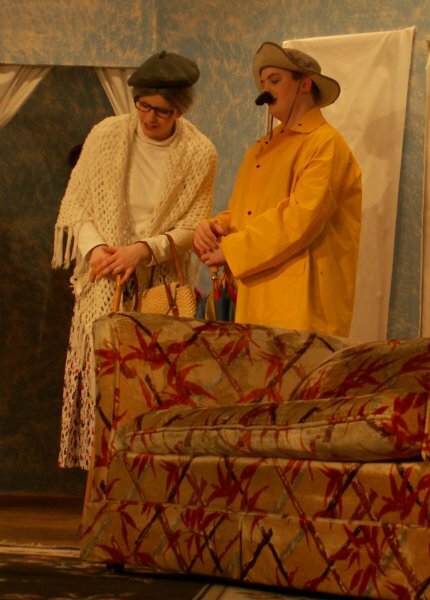 "May The Farce Be With You," was much fun for those attending the performances Friday and Saturday. The two-act British comedy was held at the Raritan Opera House. Members of the Elite Idealistic Earth Individuals Organization, the E.I.E.I.O., held their annual conference at a health spa called O. MacDonald's Farm and were attacked by invaders from the evil planet Inferna. Star Raider (Mike Lewis) the villain discovered the secret of the E.I.E.I.O. 's strength. The E.I.E.I.O. and the entire Earth were saved from enslavement by nonmembers Superbrain Jesse Sams and Wizard Woman Luci Lox (above.). The cast of 28 was directed by Mrs. Lisa Lox and Mrs. Lisa Miller.